Discussion in 'Happy Hour' started by DixieDestroyer, Apr 3, 2018. Mexico is allowing free passage (over land) of a bevy of browns from Central America...bent on breaching our border. POTUS Trump needs to ensure these mudbloods are “denied entry”. Trump has stated he is going to be sending the military to the border. He needs to follow through with this. I think he will. He has said in the last few days he is going to pull our troops out of Syria and put them on the border with Mexico. This is what should have happened years ago. FINALLY, we have a President who acts in the interests of the American people and not in the interests of the (((globalist))) criminal syndicate. And they hate him fanatically because of this. I hope so. These caravans full of entitlement seekers and immigration in general need to be stopped completely. This goes to show a strong response to aggression is always the right response. But Trump still needs to follow through and deploy troops to the border until The Wall is built. Otherwise the crap will just keep coming. Good. Let them stay there and disperse in Mexico or go back where they came from. And as far as the military goes, they belong on the border waaaaaayy more than they belong over in the Middle East fighting wars for World Bankers and Israel. EXACTLY!! They don't belong in the Middle East WHATSOEVER, as you said fighting for the World Bankers and Israel. They belong on the border with Mexico, defending America from the invasion that's been taking place for the last Fifty years. How warped is it that most of the American population has been brainwashed into thinking that its normal to have our military deployed to the Middle East, Far East, and Europe, but there is something wrong with having it deployed on the border with Mexico? If only more people knew this is the real reason we have the military there. Wars created and fought by the normal population in order for a few evil evil people to profit. The caravan of cretinous crapola seeks to violate Republic soil (by encroaching upon it). The dang Border Patrol & military need to shut that down right at the border line. Those mexcrement vermin have NO business here! A cretinous caravan of crapola crossed the US/SoCal border. It’s utter treason that these parasitic pukes were allowed to encroach on Republic soil! I guess if this was an invasion of white males the liberal media would be asking why don't the border patrol shoot them. I really believe the U.S. media is playing a big part of encouraging this invasion. There is no news you can watch and get the truth including Fox News, they finally went over to the dark side by backing Jim Acosta against the white house. Can I ask why we don't just run about 100,000 volts of electricity into those fences and see how many try to scale them? Too much $ or what? I would think it wouldn't take but one electrocution to give them the message. Maybe I'm wrong? Had a sick feeling we would just let these cockroaches waltz on through. It would be a safety hazard for people on the US side too. From what I have seen of the San Diego walls/barriers, people can come right up to them on the beach. Somebody could easily stumble into the live wall and die needlessly. Not trying to argue, but you could put a barrier in front of the electric fence as a warning. People do things needlessly everyday here, like drive while reading their cell phones. I see people walking straight out into busy streets all the time without paying attention to where they are going, etc. I just think theirs a way to stop this if we really want to. I am with you CS there has to be a way to stop this from happening. I can't understand how a prison guard a on watch in U.S. prison can shoot to kill an inmate trying to escape, why can't a border guard shoot someone illegally coming over a border wall. My way of thinking is put up razor wire and maybe some claymore mines. Try anything to you find something that works. The bottom line is that it could easily be stopped. Deadly force, a bigger wall, electric fences...there are many ways to effectively stop the flow of illegals. The real issue is that the powers controlling things don't want it stopped. It isn't hard to protect the border if you are willing to just commit to doing it. We all know what's going on, we just aren't ready yet to admit or accept that the US is a lost cause. The evil left is slowly winning the war in ruining America. The flow of migrants isn't just going to stop and the half-assed efforts are just slowing things down a little. Here’s yet another reason we don’t need these mexcrement invaders on our soil...63% of ‘non-citizens’ are on welfare..that’s nearly 5 million households! 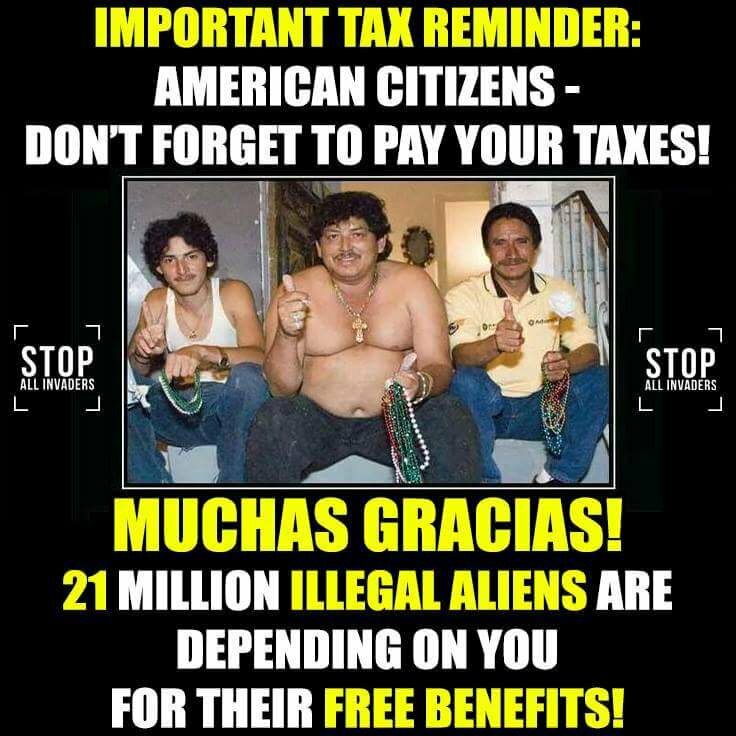 Any ‘non citizen’ shouldn’t even be in this country, & certainly NOT get one red cent of taxpayer subsidies! Mexicrent invaders tell U.S. consulate they’ll turn back for $50k each (per invader). I say we (instead) give them “five” each...in lead deposits.